This has been coming for a little while now, it’s just a case of getting more details on exactly how it’s going to roll out. The ‘Petro’ is a cryptocurrency that the Venezuelan government plan to launch and back with the country's huge oil reserves. Almost sounds like an alternative to the ‘Petro Dollar’ does it? Dangerous territory if you ask me. The US tends to get upset when anyone challenges the dominance of the dollar. The Petro is going to use Ethereum, but only to conduct the ICO. After that the Ethereum based ERC20 tokens will be swapped to native tokens on the PETRO platform. The president of Venezuela Nicolas Maduro has now officially signed off the whitepaper for release. Because here you can download and read the whitepaper for yourself. This is a significant milestone in crypto history. The first example of a nation state doing an ICO, did you ever think we would see it? Unfortunately they are not using a public blockchain but it’s progress nonetheless. I mean, an actual government opting to participate in a new economy built by the people of the world? I think that sets a big precedent. It’s the first domino. Feel free to read the official materials yourself but I’ve picked out a few highlights for you. There’s always this question of how a cryptocurrency acquires value. I’ll say it again, that is NOT going to go down well the US government in my opinion. It’s a shame they didn’t opt to build the whole thing on Ethereum because then it would be unstoppable. The downside is such a path means the Venezuelan government giving up a bit too much control, plus Ethereum doesn’t currently have the capacity they’d need. Now I said a minute ago that the PETRO acquires it’s value because the government will accept it as payment for taxes, but that’s more the answer as to where demand will come from. It’s value is derived from the value of a barrel of oil. The initial price of a PETRO is set to be around $60. Then if the price of oil rises, the PETRO should follow. 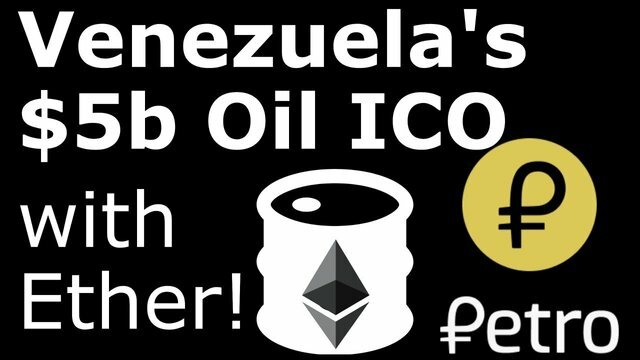 It’s basically tokenised Venezuelan oil, except it’s so much easier for the average person to acquire. It levels the playing field in exactly the way we have been waiting for. So who knows which exchanges will be selected and what kind of limitations there will be on who can trade it. Suffice to say, I have my reading material for today. I shall duly digest the whitepaper and see what else I can find. One fact to bear in mind, is that Venezuela has the highest amount of proven oil reserves in the world. More than Iran, more than Canada and than Saudi Arabia. The other fact to note is that the hard cap for the PETRO ICO is $5b. That’s 4.5% of Ethereum’s market cap at today’s price. That could cause a major pump in the price of Ether so bear that in mind as we move towards the launch of the pre-sale on the 20th of February. This could really send Ethereum into the stratosphere, but I have a hard time believing the Trump administration is just going to sit by and allow Maduro to evade sanctions with the petro. Don't get me wrong, I would love for crypto tech to alleviate the suffering of the Venezuelan people, but Maduro is practically begging to be invaded with this move. The white-paper is overall very humble about the state of Venazulean finance and monetary systems. There are no fighting words in the whitepaper and more than a few times pledge to innovate for all emerging economies. It reads more like marketing material for the IMF and UN. Trump, does not have enough backing to make a military move over this. A cyber move, that might be so... I gander this is the Russian honey pot to see what kind of flies get caught up in a sovereign analogue financial system converting into a digital blockchain systems. It is one of the best news of the 2018 so far otherwise we all know how market is performing. I am happy governments are adopting crypto. Are you planning to take part in ICO? The potential pressure points impacting the success or failure of El Petro. Clone of Ethereum or Adapted Version? Wow! Your best point is like just a throwaway line at the end. If institutions want to invest in this thing, they are going to have to acquire $5 billion worth of ether! That's something about on the order of 20x the largest ICO to date and about 5x the planned Telegram TON whopper ICO which still seems a ways out. So what'll happen if the majority of petro holders are non-Venezuelan? Wouldn't that defeat the purpose of it being a national currency? This is amazing. Thanks for sharing this information. If they have all this Oil, why do they need crypto? Start Pumping; it sure worked for the Saudis. Since this is coming from you, I'd give it a try 'cause I mean it's Venezuela, one of the worst run countries on earth. Could tell since throughout Nigeria's slump into a pit of untold hardship and recession, Maduro's nation was used as a benchmark to how low the mighty could go. But like I said, your insight shows I can't just decide to judge "petro" based on the above. I am more interested on the rise of ethereum price when the ICO starts...thanks for the info sir. that i can dig ! Since Puerto Rico is a part of the US, citizens of PR will not be able to participate in or own Petro. Unfortunate for the ones that wish to take part. Excited for what the project means in the long term for the crypto space in general but will definitely not trust anything coming from Venezuela. The credibility they have is horrible and the fact that it will no be a public blockchain should be a red flag. Worth it to read... Thank you for sharing..
Great content and this is real people! Great alternative to US dollars, but as you said dangerous teritory, Americans won't be happy. If it avoids a civil war that the rest of Latin America would rather have the USA get involved in because there is still lingering animosity between South American countries and the presence of troops from other LA countries will make things worse... we (everyday US citizen not hooked to party lines) are all for it. What if they already have the gas reserves sold or compromised (Gov. Bonds, etc)? I read a bit more. It seems the government is not really guaranteeing any oil. It is just promising to accept the petro for taxes and social services. And it will do so at a rate that is based on a formula that includes the current market price of oil. Plus they take a service charge of something like 10%!. Will the price of encrypted money in venezuela be linked to world oil prices? I have a strange feeling. I am curious to understand if the petro can be extended to use reserves from other countries. as in a decentralized system it can be open to voluntary participation! Looking forward to the ETH price rise if this catches. Eth is the presale blockchain, they plan on migrating to their own blockchain in a 1:1 exchange. on the other hand, in the month of February will be activated the petroyuan which will put an end to the petro-dollar and allow the participating countries of the yuan to exchange money for gold. It also enters the game of strategy and politics Russia which also shows the possibility of a cryptocurrency partner business and ally of Venezuela and also sanctioned by the United States. Finally, venezuela is not alone the current situation of blockages and crises forced the government to take the first step and all countries to the expectation to make a ico based on their raw materials! You can NOT trust venezuelan government. Be careful. say that the country is the fourth largest exporter of hydrocarbons and that the population is poor.in any case since the repeal of the puntofijo pact , venezuela is advancing , even if it s going through tragic sacrifices. i have good hope for this country to the bolivarian soul.